This isn’t the most well-known Usenet service, but ThunderNews packs a punch and gets the job done in terms of performance, flexibility and security. 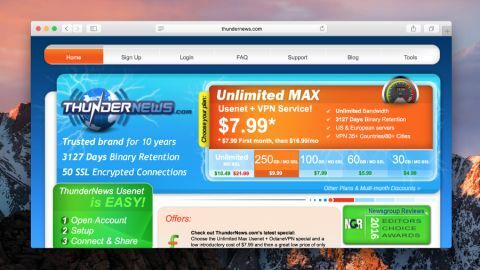 ThunderNews may not be the most well-known Usenet service on the market, but it’s vying for your attention as a premium newsgroup offering that works with thousands of third-party servers across the world to provide a plethora of options. The service offers a tempting combination of solid connection speeds, lengthy article retention and high completion rates. What sets ThunderNews apart from other services out there is that it provides Usenet capabilities that are uncensored, unfiltered and without logs. It has servers based across the US and Europe which are accessible to users worldwide. ThunderNews works in a similar way to other Usenet services, requiring you to connect to servers using ports for either standard or SSL connections. As is always the case, the type of connection you choose depends on how secure you want your usage to be. When it comes to retention, ThunderNews certainly doesn’t disappoint. The platform offers users more than 3,000 days of binary retention and 1,265 days of text retention. You’ll find that these retention rates are pretty much the same as other providers. There’s a major focus on flexibility here. Using ThunderNews, you can access a wide range of popular binary and text newsgroups. In total, the service covers over 107,000 newsgroups across the globe. They should all be active, and the company is constantly updating its content library. Overall, this is generally a reliable network, sporting a 99% completion rate. Speed is one of the most important considerations when it comes to choosing the ideal Usenet service. In the case of ThunderNews, it certainly doesn’t lag. You’re able to access American and European server farms through up to 50 concurrent connections. Wherever you happen to be based, the process of connecting is the same – there are a range of standard, SSL and alternate ports available. You get plenty of options in terms of which newsreader application you use, too. Every member can use a free copy of NewsRover, which is updated regularly. While there aren’t major issues with NewsRover, you have the option to use a third-party client. You shouldn’t have any problems with popular applications such as NewsLeecher and Newsbin. Security-wise, ThunderNews isn’t all that different from other providers. As already mentioned, you can use SSL encryption, and it doesn’t log member usage. Thanks to a partnership made with OctaneVPN, you can make use of a VPN tool to ensure that your data is always secure, and that your online activities aren’t tracked by third-party organisations. If you run into any problems, you can access the company’s online support and FAQ page. You’re spoilt for choice in terms of subscription options. The best value plan costs $7.99 (£6.55, AU$10.60) for the first month, before going up to $16.99 (£13.95, AU$22.50). For that, you get unlimited bandwidth, 3,127 days of binary retention, access to all the company’s servers and a VPN service that works in over 35 countries. You can find all the details on further plans here. Overall, ThunderNews is a decent Usenet service, and it’s definitely one to consider. Although the prices of its plans vary greatly, they aren’t too expensive generally speaking. As well as being relatively affordable, there’s also decent retention, support and security options on offer here.